The CCTX was created to build a secure Canada where all organizations, both private and public, collaborate to reduce cyber security risks. We do this in two ways. 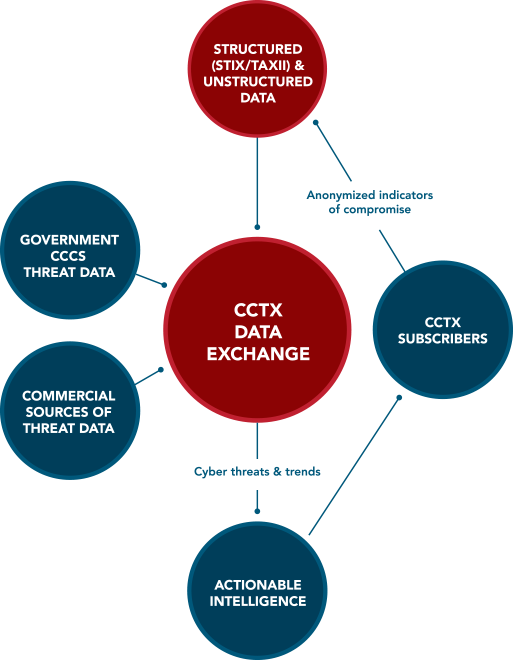 First, through the CCTX Data Exchange we gather, enrich, analyze and share cyber threat information across business sectors and from other Canadian and international cyber threat sharing hubs. And we provide actionable cyber threat intelligence with a Canadian focus. Second, our CCTX Collaboration Centre is a unique forum for cyber professionals to solve problems by exchanging best practices, techniques and insights. CCTX analysis of data from these sources generates actionable cyber threat intelligence. Our members include some of Canada’s largest businesses. Through the CCTX, members can share information anonymously and with no identifying customer information. By removing these barriers to collaboration, the CCTX makes it possible to analyze vast amounts of cyber threat information to identify attack patterns and indicators. The CCTX will use the most appropriate commercial data feeds to augment our other data sources. The CCCS is the primary Federal Government point of contact on cyber security operational matters, including incident response and coordination.Data provided by the CCCS will include high-confidence indicators of compromise from malicious activity detected on government networks from cyber threat actors including foreign states, hacktivists, criminals and terrorists.